“Mobile Homes” does not want to make anything easy for a viewer—that’s its point. It throws you into the unpredictable lives of a trio living off the radar: mother Ali (Imogen Poots), her boyfriend Evan (Callum Turner), their son Bone (Frank Oulton), and the van-based existence they’ve made for themselves. They make some money by selling various pumps and random animals, and have made a practice out of dine-and-dash. Somehow they stay warm in their snowy surroundings, somehow they eat meals, somehow they keep living this way. Writer/director Vladimir de Fontenay keeps his perspective intimate and his editing scattered as their parenting becomes progressively more stressful, and they clearly struggle to sustain their independent way of life. But under his microscope, they don’t feel like real people lost so much as white American trash test subjects. These are humans who serve no masters except for money, and their bond with each other is elastic, if not reckless. Early into the movie, Evan ditches Ali out in the middle of nowhere to walk back in the snow, but he arrives back at their home base motel at night, with fast food in hand, right after she's found her way back; not long after they make amends by doing it in an indoor pool. All the while, the family has a chicken that they’re grooming for battle, which Bone carries around like a pet. There’s a big meaning to all of this, and yet the movie can’t eloquently express it, even though the metaphor is in the title. Instead, it tries to make drama out of it, big (an admittedly impressive chase sequence with a mobile home in the third act) or small (the constant changing sense of home for the family). There are visual splashes too, but they only highlight the metaphor's shabbiness, like a random but hollow time lapse sequence that shows the back of a new mobile home close-up as it’s being driven away. And yet the film persists with its fixation, only working to dispel any stigma that these homes are less than: after watching this movie they do feel beautiful, inside and out. There’s an off-putting atmosphere to “Mobile Homes” that the story puts more care into its poetic whims than its characters, allowing their stressful decisions to define them without providing emotional connection to the audience. That’s assuredly the case with Callum Turner (who is also in “Fantastic Beasts: The Crimes of Grindelwald” this weekend). His Evan is a faded copy of many a wily, grimy young man whose aggression can easily implode into nervous desperation, especially as he seems to only have his girlfriend and son to lord over but also keep him company. He casually traumatizes both of them, and it’s meant to create tension for us, and some type of sadness. But instead of being a tragedy that inspires the deepest of empathy, he's tedious, vacuous. “Mobile Homes” is given a pulse by Poots, as someone worn down by her choices and alternately relieved by a new life. And yet, she still has a haunting capacity to destroy relationships, or to be influenced by people like Evan. There are stolen moments in the film that find her expressing a wonderment with the idea of having a home, a sense of organization; more scenes of her building a mobile home, studying their purpose while finding her own, might have actually helped the story. But de Fontenay seems to want to put this character through the grimy indie wringer as if to make his grand point; the stability that Poots provides at the film’s core proves to not be enough. However we may feel about these characters, it becomes hard to know what the filmmakers feel about them and their decisions. What they do offer runs cheap—impressive abject misery, weather that looks like it's slowly giving everyone frostbite, and the discomfort of watching Bone constantly disappear, as if he’s one bad decision from wandering off and never being seen again. Add to that a fatal lack of texture, that the movie doesn’t take place in a specific location (it's a French-Canadian project shot in Ontario with a lot of New York license plates). This is poverty as a bland color palette, the characters blending in with their desaturated surroundings in a way that becomes plainly uninteresting. 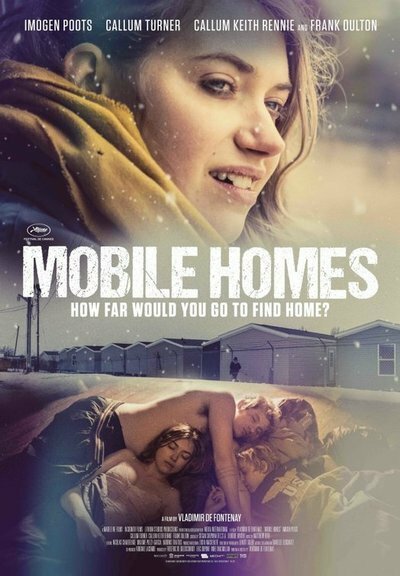 “Mobile Homes” pines to fit in with recent films of similar socioeconomic interests—the freewheeling makeshift family of “American Honey,” the visceral nature of homelessness in “Heaven Knows What,” or the non-fantastical idea of youth in “The Florida Project” (de Fontenay’s film premiered at Cannes the day before the latter did in 2017). But “Mobile Homes” is missing that genuine curiosity and detail that can make observations into these off-the-radar lives so revelatory. Even if the coldness towards character and story is the point, there’s much too little to take away.